Communication is key to the smooth running of everything in life. As Seamus Heaney said: “If you have the words there is always the chance that you will find the way”. 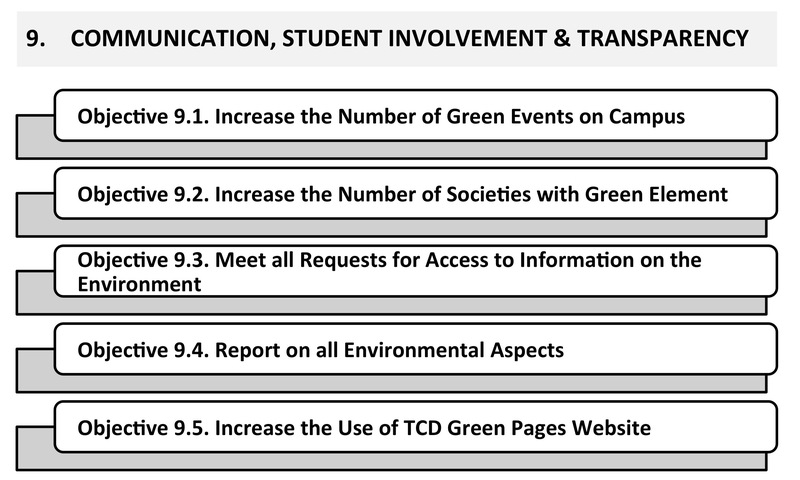 Trinity has established a number of active avenues of communication to ensure that senior administration can communicate with campus members and that campus members have means to communicate their concerns, ideas and queries to appropriate sources. The Provost’s Advisory Committee on Sustainability and Low Carbon Living was established in 2017 to drive sustainability initiatives throughout the administration and across campus. A sustainability guide is provided electronically to every campus member, covering waste reduction tips, energy conservation measures, resource efficiency and sustainable transportation options. This guide also has embedded links to bring the reader to further sources of information on environmental topics and habits. A Staff Sustainability Network connects staff across faculties, buildings and departments, in order to innovate, share good practices, and improve sustainability habits. The Student Sustainability Network, which provides a forum for discussing ideas and sharing solutions to environmental issues. The Trinity Green Week has been run every spring since 2004 and is an annual celebration of all things environmental and nature-based. It provides a forum for staff and students to share innovative ideas on how to protect and rebuild the environment, both locally and globally. The Green Campus Committee is open to all campus members, including students. Find out more here. Trinity aims to bring transparency to the conversation on sustainability and does so by publishing an annual Sustainability Report. The European Communities (Access to Information on the Environment) Regulations 2007 give legal rights to those seeking access to environmental information from public authorities.